Unlimited sending. US-based support. Email experts on staff. iContact Email Marketing helps businesses of all stages and sizes get results. From the small business just getting started, to the professional marketers and agencies, to high-volume senders with 25k-500K+ subscribers, iContact offers a plan to meet every need. All customers get a Success Manager dedicated to getting you up and running quickly, unlimited access to award-winning technical support and a 98% deliverability rating. iContact Email Marketing Reviews Recently Reviewed! We find iContact always exceeds our expectations, really! Friendly folks, easy to use, inexpensive. Pros: The flexibility and ease involved to create stunning emails - in our case, weekly church eNews; monthly newsletter and special announcements. The new web site was a major thrust forward in our ability to look loads more professional and that draws visitors to our doors. The customer support team are friendly, down-to-earth and never sound like they are reading from a script. They listen well, explain what the problem may be, find solutions and even work-arounds to achieve what we want to produce. They welcome suggestions to improve the site. As with any shift in process, it took a bit to grasp the new site, but it was well worth it, especially that we knew we could reach out for support where truly no question was too dumb. The features are easy to manipulate, and the ease to populate our emails on social media was a real benefit for us. Congregations, by definition, need to be thrifty with funds and iContact still remains our best value for what we get, and we do comparison pricing on an annual basis. Result? We've been with iContact for 8 years and they still are our choice. Cons: We would welcome and make use of a larger variety of templates if they were available. Currently templates favor clients who are in the sales market. This challenges us to be creative in modifying a beautiful template from sales to event promotion. More templates for the non-profit and religious clients would, frankly, be a blessing. Overall: It makes my life loads easier. I can use my graphic design abilities to make eye catching emails and that intrigues people which leads them to want more information about our church. I can whip up an email in less than half the time it took prior to contracting with iContact. Also, being able to call customer support and rarely have to be on hold is a benefit along with the support coming from people who are easy to talk to, who converse as real people rather sounding mawkish. Hello Doug. We are so excited that you have been an iContact customer over the last 8 years. It makes us happy to hear that you have been able to create more professional emails with iContact in half the time! Thank you for your feedback about adding more templates as well. As you mentioned we are always open to suggestions for improvement, and will pass your comments along to our Product Management team for possible updates in a future release. Cons: Their templates leave much to be desired. If you have some html/css knowledge and are creative, then you can modify theirs or create your own. Sometimes our emails would end up in spam, without explanation from Icontact. Icontact is a good company, however if you are considering in moving to Enterprise account, you may consider looking elsewhere. Stick with regular technical support plans due urgent issues being resolved quicker. They have a deliverability team but they may disable sending and removing large amounts of emails without a warning which is very strange especially if you need to send out emails the next day. Thank you for taking the time to write this detailed review. We are so glad to hear that you were very satisfied with our responsive technical support, and above average deliverability rates! Our deliverability team works hard to ensure the messages sent through our system are not unsolicited. This can sometimes result in us investigating accounts if we see a large number of bounced emails or spam complaints after an email send. We understand this can be an inconvenience, but it helps us ensure that we maintain a positive relationship with the major email providers which leads to more fast and consistent email delivery. We appreciate your honesty, and are excited to continue working with your company. Pros: iContact is a very user friendly product for anyone. My company sends thousands of emails a week and we are always very pleased with how easy it is to create an email and send it immediately. I also really enjoy the dashboard, it helps me keep track knowing what emails have been sent and what emails I have yet to send. i also appreciate that iContact technology can delete any duplicate people in a contact list. That saves me time from having to go through thousands of people making sure I don't have any duplicates. My customer support is also amazing. My iContact rep. is always so good about getting back to me when I have questions or concerns. Cons: Sometimes when I am creating a contact list in iContact, I have several excel sheets I need to upload to that one contact list...iContact doesn't let me select multiple excel sheets to upload at once, I have to do one at a time which takes a lot of extra time for me to do. I also wish I could delete more than one contact list at once. Hi Lauren! We sincerely appreciate you taking the time to provide this feedback. Our support team loves helping companies like HireLive who make such a tremendous positive impact. As for the concerns you raised about list uploading, we are taking all product improvement comments very seriously and are working to continually improve our product. We currently do allow you to have 5 concurrent uploads at any given time, but you must start the uploads one at a time. And you are correct, we cannot upload multiple sheets from one excel file. We have noted this potential feature, along with multiple list deletion, and title expansion ¿ and we realize its importance. Thank you again and have a great day! Pros: iContact is easy to use in most cases. There are tons of different templates and creating your own email template is a breeze. If you get one of the Pro plans they'll even help you make templates for future use, so that's great, too. There are plenty of ways to upload data and keep track of that data. In fact I tend to use iContact to export my data for use on other platforms because it keeps everything so nicely. My point of sale doesn't even allow the breadth of exports and options that iContact does, so it's more than just an email platform to me. Automation is visually very simple and means that I know I'm reaching my audience at the correct times. I no longer have to manually send each email, and with the automation there are tons of options to segment in addition. This means I'm not sending frivolous emails, so that keeps our open rate high. Cons: I have three businesses that have to be kept separate and my only big complaint is that I can't copy automation plans or other things back and forth between them. So a lot of time is wasted redoing certain campaigns between the locations. I also think the social connectivity needs to be updated. Twitter for one is outdated and the actual website allows much more text to be posted than in-app. They're several updates behind on Twitter. Overall: I get the ability to reach my customers and turn them into return customers week after week and year after year. Hi Trevor! We are thrilled to hear that iContact¿s design services and automation tools make your job easier and your emails more impactful with your customers. At iContact we value being your one stop shop for your email marketing needs. We also appreciate your feedback about copying your automation plans from one platform to another. We¿ve noted this feature and completely understand how it would be helpful. Thank you and have a wonderful day! Our organization has been with I-Contact for 8 years-we love the impact of the communications! 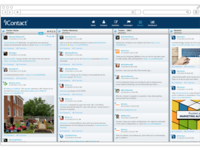 Pros: We LOVE the new Dashboard, updated templates, and the functionality/features during message composition. During the last several years, I-Contact updated the above features, but before doing so asked the CUSTOMER how they could improve their systems. This feedback was definitely taken into consideration as you could so them reflected in the updates. Since then, I-Contact continues to improve the platform with new templates/functions that add to the impact of each individual message. They are a SOLID email marketing solution for companies big and small. There price is in some cases lower than their competitors while offering the majority of the same features. Third, we have been extremely impressed with the level of customer service provided by their team. If you ever have an issue, they are quick to address and provide a solution! Cons: Only 2 areas where we would like to see improvement. More connectivity options with other services/websites in order to be able to export/upload new contact information. Also, a more seamless mobile app that would allow for managing of content/messages. Also, consistent, new email templates added to reflect more types of communications: SAVE THE DATE, EVENT ANNOUNCEMENTS, NEWS UPDATES, etc. Hi Brent. Thank you so much for being a long time iContact customer of 8 years! We are so pleased to hear that you love the upgrades we've made over the last few years. We believe that customer feedback is an extremely important tool in creating a better product, and will continue to reflect this feedback in future releases. Speaking of which, the feedback you provided is absolutely something that we will pass along to the Product Management team so that it can be reviewed for potential changes. The good news is that we are currently looking into integrating with other services and sites that will allow our customers even more options for bringing data into their iContact accounts. iContact is the superior mass mailing service when it comes to functionality and customer service. Pros: Off the bat, we previously used a different mass mailing service whose customer support was non-existent so it was essential for us to find a provider that we could get in touch with whenever issues arose. The team at iContact has done a great working with us and helping us through the process of switching over from out other provider. The service works as intended and the user interface is easy enough to use and create content to mail out. Customer service is second to none. Cons: I don't like that the service is not integrated into salesforce off the bat. We still haven't figured out how to get it done and truthfully, haven't had the motivation or necessity to reach out to customer service about it. When I consider that SalesForce has already endorsed its own proprietary mass mailer, I'm not surprised that there is difficulty with integration. Overall: iContact has been extremely helpful in getting our curated content out to the masses. The user interface makes it easy to create your own personal content to send out and the system provides a fairly comprehensive report of your mailer, which is crucial for anyone working in sales. It gives you an extra edge to know who opens what, how quickly and who is not interested so you can update your CRM accordingly. Great stuff from iContact. Hi Patrick! Thank you so much for your great feedback about our customer service team. They truly are a knowledgeable, dedicated, and friendly group of people. 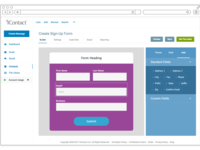 It sounds like you are on our iContact Pro platform which offers Salesforce sync. Thank you for the feedback regarding difficulties with this. We are happy to take it into account as we continue to make iContact even better! In the meantime, please don't hesitate to reach out to our support team for further assistance in getting this set up. Pros: At our business, we appreciate the timed releases, simple platform, and easy-to-access data following an email release. Cons: The only thing we wish there could be an improvement on is ease of design. It seems like there are some quirks where we try to change a font color and it snaps back to the original, forcing us to go into HTML mode to edit. Thankfully, it's easy to switch between "design-mode" and "HTML mode." Hello Laura. Thank you so much for the great feedback! It's excellent to hear that you are using our timed releases. You can set everything up ahead of time so that you are able to do other things while your messages are sending out at the time you specified. We also appreciate the feedback about quirks when trying to change a font color. We will definitely pass this along so that it can be reviewed for possible updates. One of the things that can cause this behavior is copying and pasting content from an outside source. This often brings not only the text, but also the HTML over from the outside source. The new HTML mixed with the HTML in your email can conflict causing issues like you are describing. You may want to consider pasting any outside content into a text only editor, such as Notepad, before pasting it into iContact. This way we can ensure the outside HTML has been removed. Thank you for being an iContact customer! We use iContact to send out daily event alert emails for a nonprofit - time efficiency is a must! Pros: The recent upgrade to the platform matches natural workflow (and spots for quality checks to prevent mistakes). We've saved time creating and managing our emails. We have a dedicated advisor that responds quickly when we have needs or questions. It's much nicer than an anonymous "call center" where you get who you get. I especially like the new upgrades to the platform, which reflect the way I/we work in an increasingly intuitive way. Cons: I would like to see more seamless integrations with other software and extensions, such as a text-to-join feature. Overall: iContact provides us with an intuitive platform that saves us time. We can create and manage emails efficiently, spending time savings on other needs. The recent upgrade matches intuitive work flow very well. Thanks for the review, Charlie! When we were designing the new interface one of our goals was to make it intuitive, so your feedback is wonderful to hear. With a lot on your plate, we know that saving time is critical to your day-to-day tasks. We¿ll pass your kind feedback to your Strategic Advisor. Our services and support teams love hearing that the work they do makes such a positive impact on your work. We are always looking to enhance our integration offerings, so if you have specific software or extensions in mind please let your advisor know! Thank you again! I have been using I contacts for four years. It was an easy tool to learn and great for marketing. Pros: I can set up email blasts in advance. When I go on vacation, I set up 3 or 4 email blasts in advance that will go out as scheduled! The advance tier customer service is super helpful and easy to get in contact with. I give this company 5 stars on customer support. Cons: With the latest revisions made, I have fewer critiques. Adding an image can be a little time consuming because jpgs need to be resized to no more than 200 kb. The spell check is a little time consuming. I typically cut and paste all my text into word to look for spelling errors. It's a bit quicker. Overall: This is the main tool I use to do internet marketing to my contact list of more than 3000 clients. Hi Nancy. It's great to hear that you are using our email scheduling feature! This lets you get everything set up ahead of time so that you don't have to be logged in for the actual sending. We appreciate the feedback about resizing images to 200 kb. We understand that this can take a bit more time. Our goal is to ensure as many of your emails reach inboxes as possible. One way to do that is to ensure image sizes remain small so that messages are not seen as possible spam. We are happy to look further into this to try and speed up the process in a future release. Thank you for being our customer! iContact Pro is really great for some people! Please do your research before purchasing. Pros: In 2017 iContact came out with many nice updates, the best of which was the ability to copy over email templates to different accounts, which has saved us a ton of time. We really like how easy it is to switch back and forth in between our clients in our account, because we usually make changes quite often. I also really like the fact that you are able to make all landing pages and emails mobile friendly. A lot of emails are being opened on mobile devices nowadays, so it is nice to have that capability. Cons: I dislike the fact that you are unable to copy over workflows to other campaigns on your account. It seems like a waste of time to remake them all the time. The website is also kind of slow. It seems like we do more time waiting than actually getting work done, which can be very infuriating at times when you are trying to meet a deadline. I do not like how you cannot move landing pages across different accounts, because you have to copy code if you want to move them. Overall: In 2017 iContact came out with many nice updates, the best of which was the ability to copy over email templates to different accounts, which has saved us a ton of time. We really like how easy it is to switch back and forth in between our clients in our account, because we usually make changes quite often. I also really like the fact that you are able to make all landing pages and emails mobile friendly. A lot of emails are being opened on mobile devices nowadays, so it is nice to have that capability. I think they will continue to make more improvements in 2018. Hi there and thanks for your review! We're glad you are enjoying some of the updates we made this past year, we are constantly working hard to find new ways to save our customers time and improve their experience with iContact. We have big plans for 2018 which will include some performance enhancements, more flexibility within your account profiles, as well as some new features that we hope you'll like! Pros: I have been working with the iContact Premier Services team to build a suppression list and implement a reengagement campaign. This is helping our emails reach the inboxes of customers and prospects that had stopped receiving our emails. The Premier Services team has been great to work with and have been so helpful with building and executing strategy. Cons: The new email editor is a big improvement but still feels a bit clunky. I also wish there was an easier way to manage bounces - figure out why contacts are bouncing and resolve the problem. Thanks for the review, Rebecca! Re-engagement campaigns are an incredible way to boost your deliverability, and we¿re thrilled to hear about your success! Reaching the inbox can be a challenge but we are here to help reach as many of your contacts as possible. Regarding the new email editor, we¿re still making improvements to its functionality and addressing bugs. Thank you for your patience with this process! We¿ll have your Strategic Advisor contact you to review your bounced contacts. There are numerous reasons as to why a contact bounces and different types of bounces, so there are several strategies they could suggest. Thanks again for your time and have a great day! Very few features to really make emails stand out. I can't always design it how I want to. Pros: It's easy to use as long as you don't try to get creative. I also like that you can copy a previous email and use it as a template for a new email - much quicker. Cons: Sometimes it won't send test messages, and, a few months ago the Facebook connection feature stopped working so I haven't been able to use it. Also, it's a pain to include pictures in an email. The text wrapping feature does not work. I get it looking great in the program, but as soon as I send the email or test it, it gets all messed up. Lastly, the links get corrupted if you try to copy and paste them in a lot, so that is frustrating if you have to redo all the links sometimes. Overall: Gets the job done. Hi Alyssa. We're happy to hear that you are using iContact to create templates from previous emails! This is one of the fastest ways to get consistent-looking emails out to your contacts. We really appreciate your feedback regarding the issues that you have encountered. We believe that customer feedback is key in creating a better product. This has been passed along to our Product Managers so that it can be reviewed for possible updates in a future release. Thank you so much for taking the time to make us aware of your concerns. The features you want with the support you need. Pros: We have not found anything we cannot do with iContact. If we can't figure it out a call to support gets us the answer we need. For those looking for API support, according to a large client of ours the API is very robust and easy to use. Cons: There are UI areas in the software that can be improved. The creation and management of segments needs to be easier. Overall: We have used iContact for ten years to manage the email marketing services for our clients that range from single locations to hundreds of locations. The software has grown with us over the years as demands for automation and integration with third party systems have increased. The key to great software is support combined with the features you need. We found that with iContact. Hi Dave! Thank you so much for your review. We're so happy to hear that we're continuing to meet your business needs after all of these years. Customer happiness is our top priority! Also, thank you for the suggestions for improving the segments UI. We will definitely take these into consideration as we continue to evolve the platform. Thanks for being such a loyal customer over the last decade! iContact allows me to engage members and others to get information out fast! Pros: I like the ease of selecting all or just some contact lists for individualized messages. Formatting is easy, and you can switch seamlessly between HTML and Design mode while working on your message. Customer service has always been very responsive anytime I have had a problem or question. Cons: The one thing I wish I could do is edit images within the document if the sizing is not quite right. If they can ever get this functionality going, it will be perfect! Overall: Lots of functionality in communicating with our member base as well as our broader base of contacts. Keeps us in front of those we are targeting with our information. Hi Karen. Thank you for your review. We're so happy that we're meeting business needs, whether it's with our email editor, list management or even customer support. Providing an exceptional customer experience is our team's primary goal. We also appreciate the feedback around image resizing. We're constantly evolving the platform, so we will keep this feedback top of mind. Thanks for being such a loyal customer! iContact lets businesses manage multiple mailing lists and social media accounts with relative ease. Pros: I appreciate the ability to maintain a large number of segmented mailing lists. 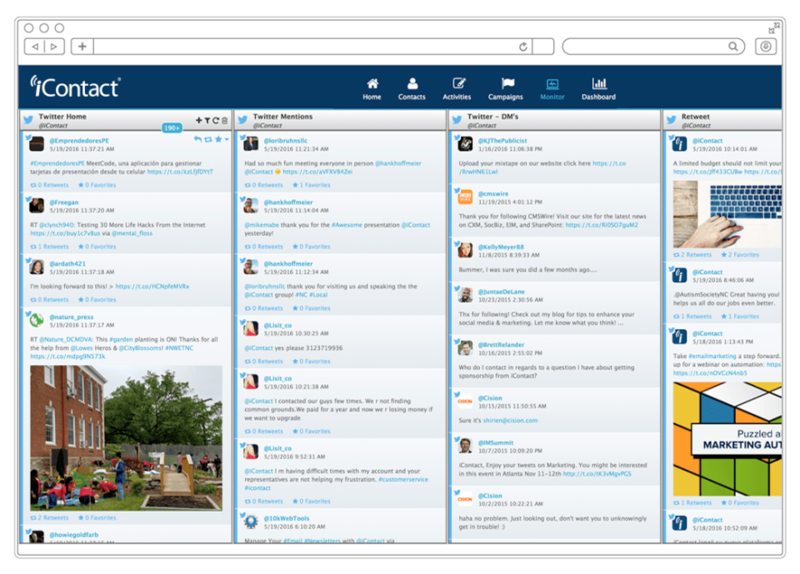 It's easy to view and compare engagement at a glance through open and click through rates. AB testing is easy and efficient. Cons: Email builder can be a little restrictive, I'd prefer more freedom and flexibility. Support are US based and support for premium users is restricted to relatively limited times for those of us based in Central Europe. Thank you for your review! It's great to hear that you have been utilizing segments. This is the best way to separate out your contacts for mailings. The feature is so popular that we are working on adding even more segmentation options. We care about our customers throughout Europe, and have worked hard to ensure we will be fully GDPR complaint before the deadline. We have a dedicated team that has made this transition their first priority, and continue to work out all of the details as we speak. We hope that you continue to use iContact for years to come! I have used Icontact for over 7 years and Love It. Pros: Ease of use and up time. Emails get delivered and social media integration is Great. The tracking tools give great feedback. Contact management is easy to use when adding and deleting contacts and creating groups. Cons: Needs more created templates for quick editing and use. When it comes to contacts and subscriber counts, subscribers who have opted out is counted in total number of subscribers in the pricing of various plans. I understand that those subscribers have to be stored to block unwanted email but you shouldn't be penalized by counting them as part of the number of subscribers in your plan. Only active subscribers should be counted in that number. Hi Jeff. We appreciate you being a loyal customer for over 7 years! It is excellent to hear that you are getting such great feedback from our tracking tool. It is so important not only to communicate with your contacts, but to actually see how effective that communication was. Thank you for the feedback about how subscribers are counted. Hopefully we can clear up any confusion related to this number. Our standard iContact plans charge based on the number of subscribers in your account. Contacts who have opted out of your messages are still listed on your Contacts page, and even counted in your total number of contacts. However, only the contacts who can actually receive emails (subscribers) are counted for pricing purposes. Thank you so much for choosing iContact! Pros: The software has come a long way from its earlier stages. The editor is VERY user friendly, but of course has its quirks just like any email software. iContact has worked the best for us, and given us the ability to create an email marketing strategy that is fine tuned to our audience and what they respond to. There is a lot of flexibility and functions that make this product easily tailored to your specific needs as a brand or business. One of our favorite things though, is the support team and specifically our own specialist that has an answer for every problem. He has gone above and beyond to make our experience as smooth and effective as possible. Cons: As we mentioned, there are quirks with any email software. In particular there are some design/layout functionalities in the new editor that sometimes don't line up just right - or at least don't give us the full access to configure the email certain ways. But we always find an alternative way to make it work. Thank you for your review! 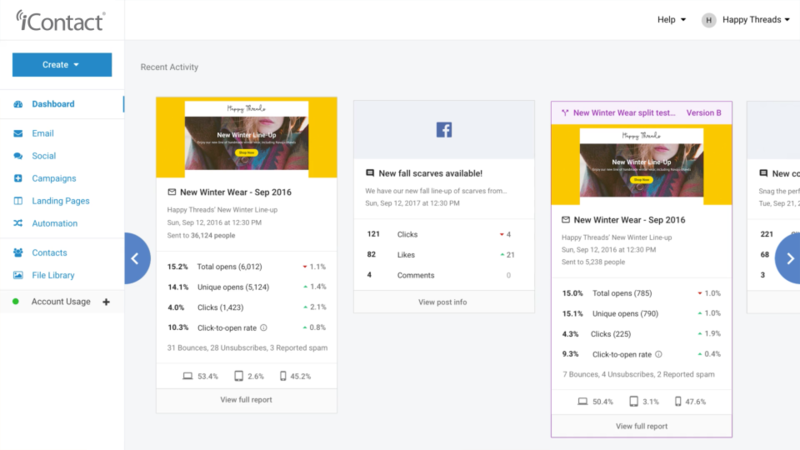 We're thrilled to hear that you're liking the new email editor and we have so much more to come in 2018. As you mentioned, we have a fantastic support and services team who are always eager to help in any way they can, including taking any feedback on quirks or enhancement requests and passing it along to the product and development team. Please feel free to reach out to your specialist with specifics - we're always doing our best to improve based on customer feedback. My experience working with iContact has been extremely positive! Pros: Building workflows is incredibly easy. They take the mystery out of building comprehensive automated workflows that make a marketer's life easier. And the support is amazing. My company's Strategic Advisor is helpful and eager to answer any questions she can. If she doesn't have the answer, she always takes the time to think it through and get back to me with solutions. Cons: We're having some issues with open/click discrepancies, which is frustrating, but Strategic Advisor assures me the support team is working on a solution. I'd like access to more comprehensive analytics. Strategic Advisor pulls monthly reports for me, but I'd love the ability to pull these reports myself. Thank you for taking time to leave a review. We're happy to hear that your overall experience has been extremely positive. It's also exciting to hear that your Strategic Advisor has been meeting or exceeding your expectations. Thank you for your reporting feedback and suggestions, as well. We're actively working on a new reporting experience and will keep your comments in mind as we're making enhancements. Thank you for being a loyal customer! I love iContact and the support I receive from my advisor. Pros: I like how easy it is to use and teach to my colleagues. iContact is always looking to improve their products and roll out new features so it grows as our email marketing plans do. They're also open to feedback and value the input of their users. Cons: I wish there was a summary at the end riiiiight before you send a message where you can see what lists you're sending to and what lists you've excluded. Would make the "Scheduled Messages" feature *that much more* functional for us. Overall: Easy to use and the peace of mind that all of our communications are responsive and beautiful in our readers' inboxes. Thanks for your review, Rhiannon. Delivering an exceptional customer experience is a top priority for our team, so we're happy to hear that we're meeting your needs. We also appreciate your suggestion for a scheduling summary. As you mentioned, we're constantly growing our platform, so we'll keep your feedback in mind as we continue to evolve. Thanks for being such a loyal customer! Incredible Support, always available via PHONE if needed. Pros: It's practically point and click - if it's not, a simple phone call and it becomes that! I love having a 'person' connected to our account - so I may frequently utilize their expertise. Many other companies do NOT offer phone help - which is a deterrent. Cons: I do wish integrating forms into our website is easier - but it seems to be a hassle. Mainly because we've spent over a year creating our own forms to find out it isn't compatible with iContact. We're working on a solution but it is tiresome. Overall: One-on-One support, ability to save templates, monthly projects. Hi Katy. Thanks for your feedback! We're pleased to hear that our support and services teams have been so helpful for you. Your happiness as a customer is our top concern. 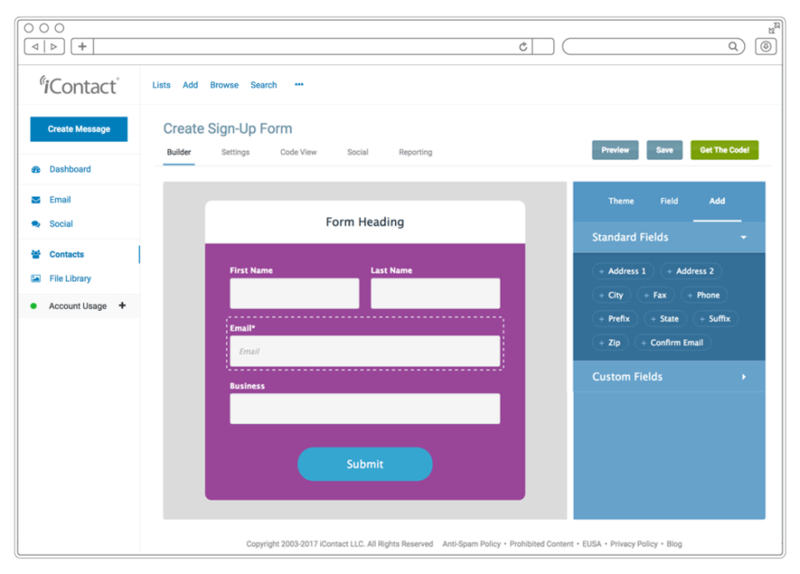 We also appreciate your feedback around form creation. We're aware of the issue you're experiencing and are keeping it top of mind as we continue to evolve our platform. Thank you for being such a loyal customer! iContact has always provided the best services and support for bulk email marketing. Pros: I have a larger account and my dedicated iContact account reps are fantastic and do all sorts of things to help me grow my lists and increase my exposure to my clients. Integration with social media and many different platforms and apps is a huge plus, and their interface is plenty powerful while still being easy to use too. Cons: They have a good number of templates available but I feel like they are too basic for normal needs, so that needs to be updated and broadened. I also would like to see their support for troubleshooting emails across different platforms and viewers extended. Overall: iContact allows me to create and send very engaging emails to my clients and prospective clients with anything from newsletters to sales emails. They also work very hard and closely with me to keep my emails relevant and my social media sites active. Hello Scott. We are glad that you have had such a good experience with your account managers and integrations with social media. When customers send out their messages we want to ensure they reach as many contacts as possible. Utilizing the social media integrations is a great way to accomplish that! Thank you for your feedback about adding more advanced templates. This information will be passed along to our Product Management team so that it can be taken into account as we continue to add new and improved templates. Ease of use. Some flexibility loss with change of software. Pros: Rapid distribution is helpful, particularly when time is of the essence- as in an announcement that is time sensitive. Cons: Limited framework of colors, boxes, etc. The former software had more flexibility in layout. When the changeover was made, the help desk was booked a week out. Hi Peg, Thank you so much for taking the time to write this review! It's great to know that iContact has been able to help by sending out your time sensitive emails. We appreciate your feedback about our new email editor as well. We know how valuable your time can be, and are always looking for ways to make creating your message a smoother process. I also noticed that you are a non-profit organization in North Carolina. To help do our part we've decided to offer free accounts to non-profits in our area. I've adjusted your account so that on your next renewal you will convert over to a 10,000 subscriber account at no charge. I hope that this helps, and please let us know if you have any other questions along the way! Pros: Our e-mails always get into the inbox, and we have a dedicated account manager. We've saved by switching from a competing ESP. Received same level of service for 1/4 the cost. Cons: Difficult to get account issues taken care of when your account manager is out of the office. Difficult to do real time segments. For example, if I want to exclude anyone who has not opened any e-mails in the past 180 days, there is not a way for me to create a segment based on that criteria that updates on its own, that is, if someone who was on the 180-day non-opener list decides to open an old e-mail, they should automatically drop off that list. Similarly, someone who was not on the non opener list yesterday who hits 180 days without opening today, should be added to that segment. Other ESPs have this ability. Overall: Received same level of service from competing ESP for 1/4 the cost. Pros: The software is easy to use and offers enough flexibility to get our messaging out to our residents. Cons: I would like it if the search function was more robust. In addition, there are times that what I see on my screen is not how it looks when I send it to myself to Q.C. I tend to keep layouts simple to avoid this challenge. Hi Amara. Thank you so much for being a loyal iContact customer of over 8 years! We are glad to hear that you find the software both easy to use and flexible. Our goal is to ensure iContact is easy for new customers to pick up on, while remaining flexible enough to give our more experienced customers room to grow. We appreciate the feedback about messages looking different after they are sent. Different email providers can display the same content in their own unique ways. Ideally we would love to offer a design that remains consistent across all email platforms, and we will take your feedback into account as we work to make iContact even better! iContact has helped us an incredible amount with everything you need for email marketing! Pros: The ease of use and the amount of help/advice they're able to provide. The customer service is fantastic. With the help of our strategic advisor, we've have great success in e-marketing: lowering our compliant rate, raising our open rates, and putting out a good product that keeps people engaged! And we don't get blocked by major email service providers because our compliant rate is low. The software is easy to use and has great customization from creating your own email and lists to scheduling emails in advanced. There's also the option to integrate via their API and automatically upload leads in real time which is a great feature. Cons: The new iContact dashboard is very nice and responsive but since it is new, you can find some bugs in the system. I'm sure this will get resolved soon so this isn't a big issue. We're always able to send our emails so that's the most important thing. Overall: Our whole email marketing campaign has benefited from this causing our company to succeed. Complaints have gone done and our open rates have gone up. iContact provides great advice whether you're just starting out in e-marketing or have been doing this a long time. We're able to fine tune our emails and get valuable insight from them. Pros: The ability to schedule emails to go out over the weekend. When I am home relaxing, the software is reaching out to qualified candidates on my behalf. Cons: When I send myself a test message from iContact or send a test message to a co-worker in the same office, probably 50% of the time, the test message is found in our junk mail. Hello Cindy, The ability to schedule emails so that you don't have to do that additional weekend work is a popular feature that we're glad to hear you are utilizing! Based on the information you included it sounds like emails may be having a difficult time making it to the inboxes of you and your co-workers due to your company's spam filters. Please review our Help Article on why emails go to spam and how to resolve the issue here: https://app.icontact.com/icp/core/help/docs/view/en-us/icontact-for-salesforce/why-emails-go-to-spam. If you are still encountering problems our support team is happy to help troubleshoot further! Pros: I have been using iContact for over 3 years now and never had any major issues with them. Email marketing gets a whole lot easier with iContact's features and amazing tools. The best thing about iContact is the ease of use. You can get started without any training. They have kept things simple, user-friendly, and their interface is top-notch. Drag-and-drop builder is another reason why its hard to switch to other email marketing services. I have tried drag-and-drop email builders of other email marketing services as well (GetResponse, MailChimpl, Mailerlite, etc.) but I personally find iContact the best in the game. Subscriber management and ability to segment subscribers based on multiple variables is another advantage that has always helped me in understanding my subscribers and sending them relevant emails. Cons: My only concern is price. It is expensive as compared to other email marketing services. Additionally, they don't have any free plan. Most of their competitors have like MailChimp and mailerlite. Overall: iContact is great in terms of features, customer support, and ease of use. If you can afford it, go for it. It will eventually pay off. iContact has been a valuable tool for growing and improving my organization's email marketing. Pros: It is quite user-friendly, allowing us to create high-quality, professional emails with strategic segmentation. Their support team is excellent. Our "Strategic Adviser" is always pushing us toward the latest industry best-practices and keeping us at the cutting edge. Their support team is also quick to respond to any challenges we have and readily offers solutions. Cons: Sometimes it can be glitchy and the format/design that you create doesn't always comet through exactly on different email platforms. Also, it would be ideal if it offered e-commerce tracking. Overall: It helped us take our email marketing to the next level and helps facilitate more strategic approaches to our email marketing and digital fundraising. With icontact we recently implemented a new digital fundraising program that has been highly successful. Hi Nicole! We're glad that you've found iContact so valuable for your organization! We'll be sure to let our Strategic Advisors and Support hear your kind words. 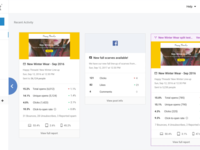 And we know what you mean: Getting an email to display correctly across all platforms is a great frustration to all email marketers, which is why we are constantly testing our themes and layouts in order to minimize those glitches as much as possible. We'll also send your suggestion about e-commerce tracking to our dev team. Thanks for your response! Cons: The DO NOT CONTACT feature. We should receive at least one email asking us to remove from a database before being placed on DNC. Overall: It is helping me make more money with less Employees. This is a wonderful platform which we have used for many years. Pros: Very easy to use and great customer support! They have helped us improve our email deliveries and upgrade our image, including our social media presence. Cons: They do upgrade routinely and it takes a little time to get used to the changes. Even then, support helped us with it. Overall: Ability to reach our contacts regularly. Hi Karen! We sincerely appreciate you taking the time to provide this valuable feedback. We truly believe that our success is deeply connected with the success of our customers, so we are happy to hear that our team has been there when you needed them. We are always ecstatic to help companies like Directors Roundtable who provide deep, actionable insight across the country. Thank you for letting us know about the upgrade process, we are always looking to make our experience seamless, and we will look into making the upgrade experience even easier for you and others. Have a great day and thank you for your time! Pros: I love the template builder functionality and that it's still an option to use the HTML Template builder. Our CRM is very particular about the types of email templates we can send out of it and iContact has helped us navigate this issue. It's very easy to train people in and to build eye-catching templates. Cons: I would prefer to have larger subscriber limits and I would prefer to be able to do functional HTML file exports for certain templates. I also think the reporting data has a lot of blindspots. I would also like to be able to make template copies across user folders without having to enlist my strategic advisor's help. Overall: I hold iContact in very high regard, particularly because of it's customer service. The strategic advisors are very helpful and attentive; they always respond quickly and helpfully. Pros: I love the flexibility this software offers. The drag-and-drop capability makes it possible to create any look you want, and the ability to reuse content from previous sends has made my life easy. We can also manage any number of separate client folders for sends on their behalf. The support team is great and our strategic account manager has been a fantastic resource for understanding the analytics and recommending ways to improve our stats. Cons: Some of the capability can be tricky as a new user, so that makes it difficult to have others step in and be able to quickly create messages. Training is key. I also wish there was a better way to connect our internal contacts database with the iContact database, right now I have to manually upload contact lists regularly. Pros: Clean reports- easy to read and understand. Salesforce sync both ways. It's easy to set up and works nicely. Good customer support. They offer great strategic support as well as help on technical issues. They are also easily accessible. You're assigned a rep, which often works better than getting a random person at any time. You can really develop a good working relationship. Cons: List management can be confusing. There are both lists and segments to be managed in the software, and it can get confusing to figure out what's a list, what's a segment. But once you get the hang of it, it can be handy. I can't say I use those features as often as I just resort back to Salesforce to generate a fresh list. Overall: Salesforce sync and better ways to manage lists. Hi Will. Thank you for your review! We're excited to hear that you're finding our Salesforce sync useful. Also, thanks for the kind words about our customer support. Making sure our customers are happy is our top priority! We also appreciate your feedback on the list management. We're currently working on some enhancements to our user experience, so we'll definitely take your suggestions into consideration. Thanks! It was a very helpful tool, especially when they change the UX features. Pros: It's really cheap, easy to use and it works with no problems at all. We had it for almost 3 years and never experienced an error, bug or anything else that could have resulted in a bad case scenario for us. Also, the customer support team is really kind and considerate. Cons: It doesn't have too much space for customization, and the templates are kinda plain. Also, the new interface was really delayed in comparison to its competition that already had drag an drop customization and a large number of quality templates. It also lacks quality analytics reports (it's really basic) and it's short of integrations with some CRMs. Overall: It's cheap, neat, it's easy to use and gets the job done! When we used we could create a large and high-quality database of clients. We could also manage a lot of email marketing campaign with a large number of people with personalized content, and the ROI was huge. Hi Barbara. Thank you for your review! We're happy to hear that we've delivered value with our reliability and ease-of use. Our team takes a lot of pride in helping customers succeed. We also appreciate your suggestions around analytics and CRM integrations. We're constantly looking for ways to evolve our platform, so we will keep your feedback top of mind. Thanks! iContact is the least stressful part of my job. Pros: iContact is super intuitive and easy to use, and with every update, more. I rarely have issues with the software, but when I do, my advisor is always available and is quick to help with solutions. He also has helped us increase our opens and clicks exponentially. Cons: The only con I have is that there isn't a way to export Survey reports as a pdf. There's a workaround, but that would make my life just a little easier. Hi Shannon. We're so happy to hear that we're able to provide such a "stress-free" experience for you! The team strives to provide the best user experience in the industry, so we're glad that we're delivering so much value in the form of increased opens and clicks. We love hearing success stories like that. We also appreciate your feedback about exporting surveys. As we continue to evolve the platform, we'll keep that in mind. Thanks! Powerful tool to send messages and manage lists. Also the iContact for Salesforce instance is great. Pros: Lots of templates, easy to use, and very easy to train users on emails/lists/template management. I've used it in three organizations and highly recommend it for small businesses. Cons: I'd like an add-on for basic marketing automation -- e.g. if an email is not opened after 5 days, set up a campaign to send a follow-up v if an email is opened and the transaction isn't completed, send a separate follow-up message. Hello Jason, Thanks so much for the review, we're thrilled to hear that iContact is working so well for you in multiple organizations and that you've had an easy time training users on our product. We have some great news for you, as part of our 2018 plan, we're working on adding several automation features. We can¿t wait to make these features available to our customers, and we hope that you will continue to give us your feedback along the way! I've used iContact for years. It's the best value for the money & the customer service is fantastic. Pros: The customer service. It is always excellent and they go above and beyond to help. Day/Evening whatever, I've gotten great service. I use them for my employer for over 5 years, but I was also volunteering for a small non-profit group that had a tiny budget. Their salesperson was fantastic setting us up with what we needed for little money, and thinking about what we might need for the future. I was really impressed. When I have had questions or the rare problem they helped right away, either on chat or the phone. Cons: Perhaps they might not be as fancy as other companies, but redesigning our newsletters isn't something we do often, so we might not be taking advantage of all the new stuff they have put in place. Overall: It keeps us in touch with our clients with ease and for a good price. Hi Matt. Thank you so much for the rave review of our customer service team! We are pleased to have a truly knowledgeable and caring staff to help you with any questions you have along the way. If you are ever interested in learning more about our new features and how to use them, please don't hesitate to reach out to our customer service team for help. Thank you for being a loyal iContact customer! As a user of iContact for 8 years now, we are true loyalists of the product. Pros: The software is easy to use, even for the most novice of users and advanced pros. We can create beautiful emails for every project big or small. Our account houses over 22,000 emails in our data base and we've never been concerned about the safety of our account knowing iContact is a robust program that takes our clients confidentiality at the top of its priorities. The software is easy to learn, so easy, we even train our interns on the program so they can help with all of our email marketing. 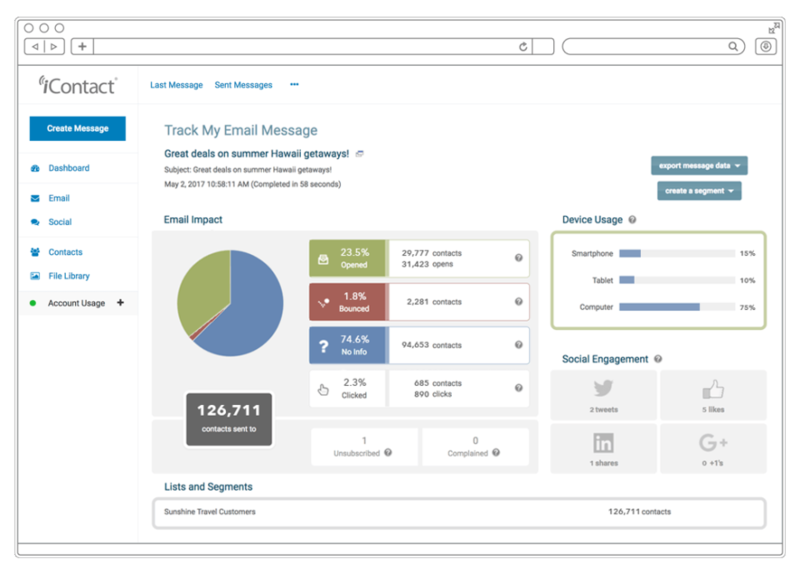 The analytics are easy to read and give full detail on all of the insights of each email we send. Cons: You can have multiple people signed into the account at once, but you don't know when someone else is signed in. Hi Jennifer. Thank you so much for being a loyal iContact customer for the past 8 years! We are happy to see that you brought up your faith in our safety and security. This is such an important aspect of email marketing, and we have worked hard to ensure you can trust us to keep this information safe. We appreciate your suggestion to show when someone else is signed into your account. We will take that into consideration as we plan for future releases. iContact Support is the best! I Our rep. is there anytime I or a store have a question or a need. Pros: I love the new functionality! the drag and drop makes creating a new email simple and easy which is great since some store owners are not technically savvy. I can't wait for the next release of software. Cons: The reporting could be more robust instead of a list of every person that clicked, I would like to see the link with the number of clicks and be able to click on the number to see who clicked. The dashboard would be easier to view if it was set up as rows so you can see more than 3 campaigns. In addition to have the ability to copy a campaign from the dashboard instead of having to go into Emails > Sent. When trying to change the font color, the theme colors show, but not any standard colors. So when you want to change the font to black, you have to go into the color chart to select black. As with any software, it has it's qwerks, but it's nice to now that iContact is actively enhancing the software. Hi Donna! We are glad to hear that you have been enjoying our new drag and drop editor. This makes creating professional emails easier than ever! Thank you as well for your feedback, particularly about the Dashboard. The good news is that we are in the process of designing an updated version of the Dashboard. We are happy to take your notes into account as we work to make the best possible design decisions for our customers. Easy and fast way to get timely emails delivered to our contacts. Pros: I like that you are easily able to create HTML emails and if you don't know HTML, they have ready-made templates that you can use where you can just plug and send. I also like the rate of deliver where emails are going to inboxes and not junk mail - makes for better metrics when you look at opens and clicks. Cons: The ability to copy and paste a URL to create a new HTML message does not always work/format the way I'd like sometimes, but I do like that ability. 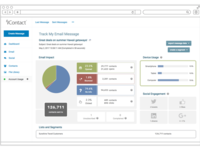 Overall: Great deliverability to inboxes and easy set up and import of contacts! I don't have to worry about going to people's spam or junk box. Hello Reginald. It is great to hear that you are enjoying the deliverability rate iContact offers! Our Deliverability team works to build solid relationships with the major email providers so that we can get as many of your emails as possible straight to inboxes. Thank you for the feedback about creating a message from a URL. This doesn't always allow for the consistency that we would like simply because there is a good deal of code used on websites that just does not render well in email format. It is, however, something that we are happy to pass along to our Product Managers so that it can be taken into account for future updates! I used MailChimp elsewhere before iContact and I think iContact's pretty good. They updated the email designer this past year with a responsive drag and drop format that makes our emails easier to view on mobile devices and easier for the less digital-savvy members of the team to use. We send a lot of emails to a lot of people and really don't pay that much to do it. Other services may offer more bells and whistles --I don't know, I haven't looked -- but for where we are now, we're satisfied. Not 100% customizable, but hey, it's responsive! Customer service is nice/helpful, the platform is user friendly. Pros: The platform is user friendly for people who aren't as versed in HTML. You're able to easily create tables/borders. The service is relatively fast. We pay for an account so we have an account manager that is able to assist us whenever we need. Cons: Their new drag/drop platform isn't able to create any template you'd like so we have to continue using our old templates. Hello Alison, We're so happy to hear that you are finding the platform user friendly! 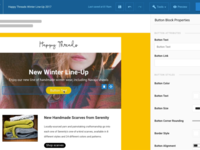 Our drag and drop email editor is designed so that new users can quickly and easily create beautiful emails. I apologize that your old templates were not able to be moved over to the new editor but thank you for that feedback. It's important to know what roadblocks our customers are facing so that we can focus on preventing them in our future releases. Pros: For the most part, it is easy to navigate. I like that it is compatible with almost any type of HTML code. Cons: I don't like how it's set up to tag contacts. My company never uses the feature because it's way too complicated and frustrating. The HTML designers also do an okay job of creating templates from scratch. The most recent one I received had too much coding and took me hours to add in content. Thank you for taking the time to write this review! We're glad to hear that you find the system easy to navigate. Our goal is to ensure new customers can quickly learn how to use iContact, while still giving more experienced customers the flexibility and customization that they want. We are also thankful for your feedback about tagging contacts. At this time tagging is only available in our iContact Pro product, but we do plan to make this feature available to all of our accounts in the future. This has been forwarded on to our Product Management team so that it can be reviewed for possible updates. Great email marketing platform and amazing customer service! Pros: iContact is very user friendly and doesn't require a designer or software engineer to use. 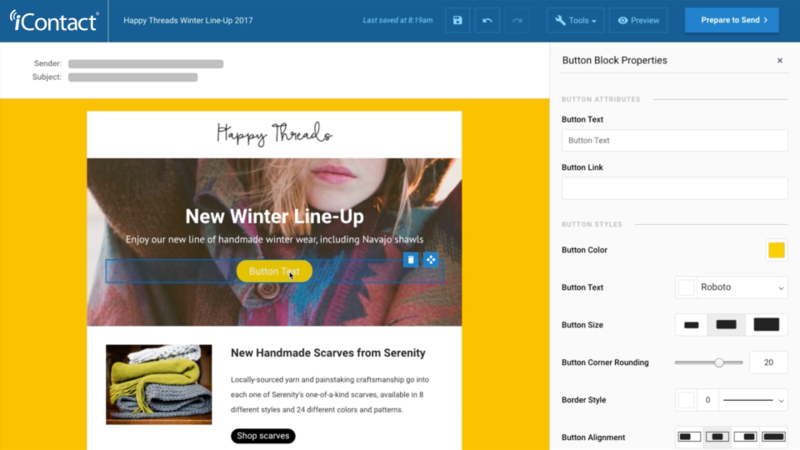 Even the most basic WYSIWYG editor will allow you to customize emails your clients will want to read. Their design services are speedy and professional. Using their premium platform includes monthly customer support calls and services. The ROI is measurable and positive for our business. Cons: I wish we were able to integrate iContact with our shopping cart (3dcart) but it's not a friendly API. Otherwise we've been very happy with iContact. Overall: Ability to reach our customers in a professional manner and it's super easy to use! Thank you for reviewing iContact. We're glad to hear that you're seeing measurable ROI from engaging with our Premium Services team. Last year, iContact Premier clients saw, on average, 41% higher open rates and 63% higher click-through rates than similar-sized clients without services ¿ while also seeing a marked improvement in deliverability and inbox placement. It pays to have the help! And we appreciate the feedback re our API - we've passed it along to our product team, and wanted to let you know that we have integration enhancements as a key component of our 2018 roadmap. Long-time subscriber and plan to be one much longer. Pros: It's fast and easy to use, which means it makes my life easier. From plain text, to HTML, to HTML templates, its' all there at my fingertips. Cons: You can't add attachment files to the email. Sometimes sending a pdf file would be helpful for a client, or a pic, but you cant. That needs to be made possible. Hi Charles. Thank you for being a long-time subscriber! We are excited to hear that you find iContact easy to use in all of our different email editing formats. We can understand the desire to add an attachment to your email. Currently we suggest including pics or PDFs inside the content of your message so that it is less likely to be viewed as spam by email providers. However, we can certainly re-evaluate this for possible updates in a future release. We look forward to working with you for a long time to come. Very happy customer of iContact Software and your overall service. Thank you! Pros: I'm very happy with all the great templates and designs! The navigation has also improved a great deal. It's easy to be creative and put out a great informational product to my guests. I also appreciate the information that I can see what worked best within the email I sent, by watching open, clicks, etc. Cons: This software is a big improvement from the previous software, so it's difficult for me to say what I like least. I don't have any complaints. Hi Jessica! We are always excited to hear from a very happy customer. It is great that you appreciate the reporting information you can see after your message has been sent. Knowing who is opening and clicking in your messages can really help to target your marketing efforts. Thanks for being our customer! Hi Rita! Thank you for your great feedback about our templates. We offer a variety of pre-made templates to help inspire our customers. We are also adding new templates all the time, so feel free to let us know if there are any specific new templates you would like to see. Thank you for your feedback about integrations as well. We are currently looking into making more integrations available to our customers. We are happy to take your feedback into consideration during this process. Thanks for being our customer! I have found iContact to work well and consistently through the years I've used it. Hello Jim. We are thrilled that you find our email metrics quick and concise! It is so important to keep track of the way your contacts engage with your emails, and we wanted to ensure it was as easy possible for our customers to accomplish this. Thank you for the feedback regarding adding more pre-made templates. We are continuing to add a larger selection of templates, but we would love your thoughts on what type of templates you would most like to see. Feel free to fill out a ticket with your suggestions here: https://app.icontact.com/icp/core/help/en-us/contact. iContact is an easy for beginners, with the customization capabilities any expert can utilize. Pros: iContact is more that and great platform, the technical assistance/guidance is the best advantage for our company. We have monthly meetings with our rep to help us get better at what we do; Take advantage of the customize-able products and measure our increased success in the industry. Our current open rate is about 30% more than 100,000 active emails. Cons: icontact 2.0 is a little slow painting our HTML code and has some clunkiness to it, but this is common for any new roll-out. I have no desire to change to any other provider. Overall: We have maintained a relationship with more than 100,000 clients by using regular email contact and, consequently, improved our ROI with all of our other products because of brand familiarity.